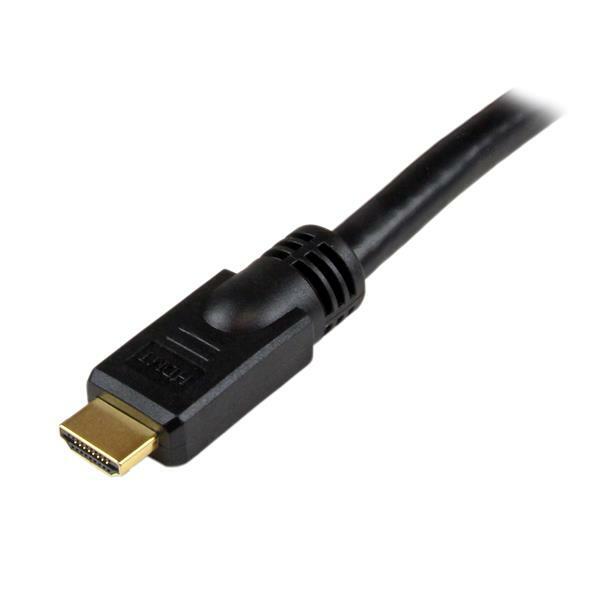 The HDMIDVIMM30 30-foot HDMI® to DVI-D cable enables you to connect a DVI-D video card (or other DVI-D output device) to a display that incorporates HDMI technology; the cable supports bi-directional operation that also allows the reverse configuration, delivering digital video from an HDMI-enabled output to a DVI-D capable display. 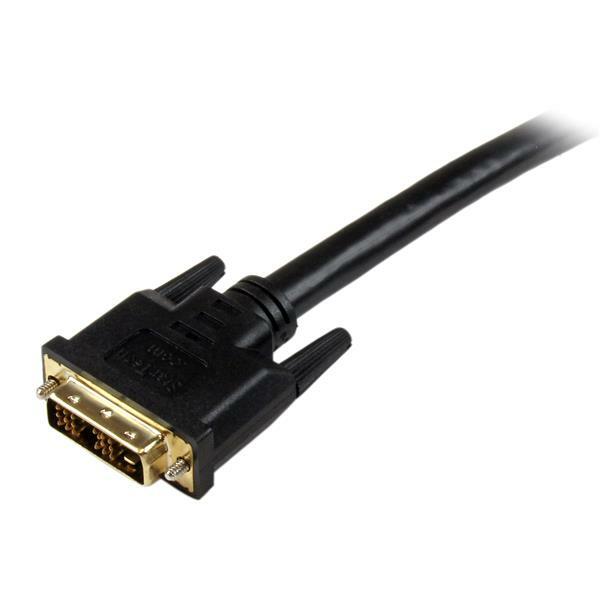 A valuable addition to any digital signage, multimedia or home theater application, this high performance cable is designed to provide the best quality picture available through either HDMI technology or DVI digital connections. 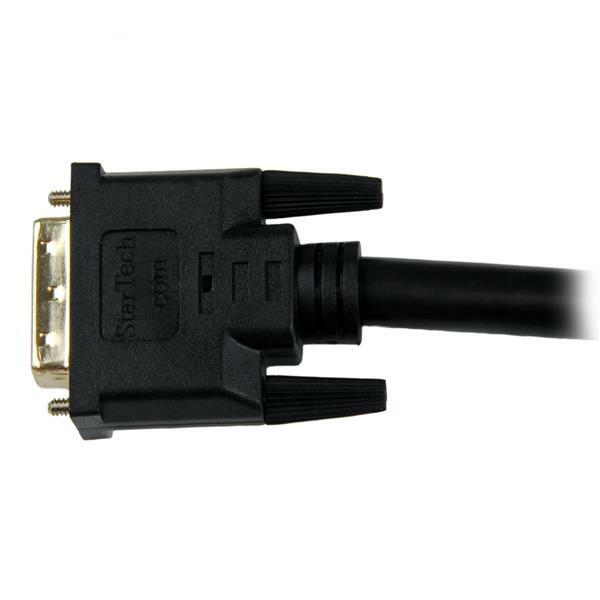 This durably constructed HDMI-DVI-D cable is backed by StarTech.com's Lifetime Warranty. When should I use a longer video cable vs. a video extender? You should only use video converters and extenders if it is absolutely necessary to do so. In many cases, most video converters and extenders are not necessary if you purchase the correct cable. The following table lists the maximum length of cable for common video standards. Note: StarTech.com offers cables longer than what is listed above, including active cables, which typically include built-in active signal boosters that allow for longer cables. Active cables are specifically designed to exceed the suggested maximum lengths and are tested at the listed specifications (for example, the maximum listed resolution). Video adapters passively adapt a cable from one connector type to another. Video adapters do not change the signal type, or change the video standard. Note: You can use a coupler to extend a cable for a short distance. However, each coupler that you use can introduce signal loss, which degrades the signal quality. Video converters actively process and change the signal type from one video standard and convert it to another standard. They are typically used to convert digital to analog and vice versa, but can be used to convert a digital signal to another digital video standard (for example, HDMI to DisplayPort). Video converters work over short distances from the source to the destination: up to 15 feet or 3 meters. Video extenders convert an input signal to a higher voltage for transmission over longer distances and then convert the input signal back to the original video standard. The input and the output signal will match on a video extender, as the same video standard is maintained end-to-end. If a cable is extended with adapters or converters, the signal quality degrades. Note: For more information on using a video adapter or converter with a video extender, see the following FAQ: http://www.startech.com/faq/video_signal_converters_convert_then_extend. Is this an active or passive converter and what is the difference? This is a passive video signal converter. A passive video signal converter changes the type of connection that is being used but does not change the signal that passes through the converter. Because the video signal is not modified, passive converters tend to be smaller, simpler, and less expensive than active video signal converters. Examples of passive converters include DVI-I to VGA, HDMI to DVI, and DisplayPort to Mini-DisplayPort converters. An active video signal converter modifies both the type of connection that is being used and the signal that passes through the converter. Because this type of conversion can be complex, active converters tend to be larger than passive video signal converters and sometimes require additional power. 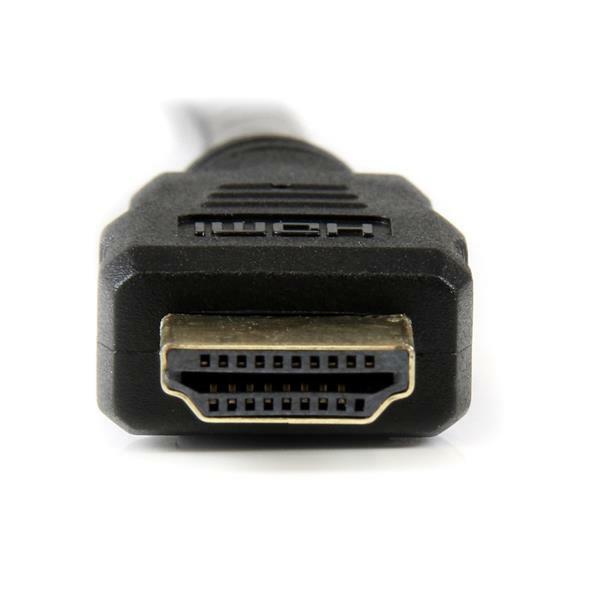 Examples of active converters include DVI-D to VGA, HDMI to DisplayPort, and VGA to HDMI converters. For more information about passive and active DisplayPort video signal converters, refer to the following FAQ: https://www.startech.com/faq/DisplayPort_Converter_DP_Multi_Mode. For more information about which type of video signal converter you should use when you convert video signals with an MST hub, refer to the following FAQ: https://www.startech.com/faq/mst_hubs_passive_vs_active_adapters. How can I tell if this HDMI to DVI adapter is compatible with my setup? The HDMI to DVI-D adapter or cable is a bi-directional adapter or cable, which allows both HDMI and DVI to be the source or destination. 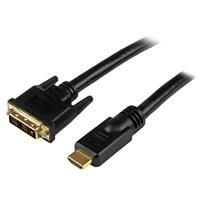 HDMI contains digital video and audio, while DVI usually only carries video. If you use these adapters or cables, they will transmit video but not audio. Use the HDMI cable, video source, and video destination in another setup to see if the problem is with the components or the setup. Use a different HDMI cable, video source, and video destination in your setup to see if the problem persists. Ideally, you should test a component that you know works in another setup. Verify that the source resolution matches the capabilities of the video source destination. For example, if the video destination is only capable of 720p, then the video source cannot output 1080p or 1920 x 1080, as that exceeds the capabilities of the video source destination. Test at a lower resolution, for example, 1024 x 768. If you are using 4K resolutions, test with a shorter cable. The source is set up to output audio over HDMI. The destination is compatible with the source's audio format. The destination's volume was raised. 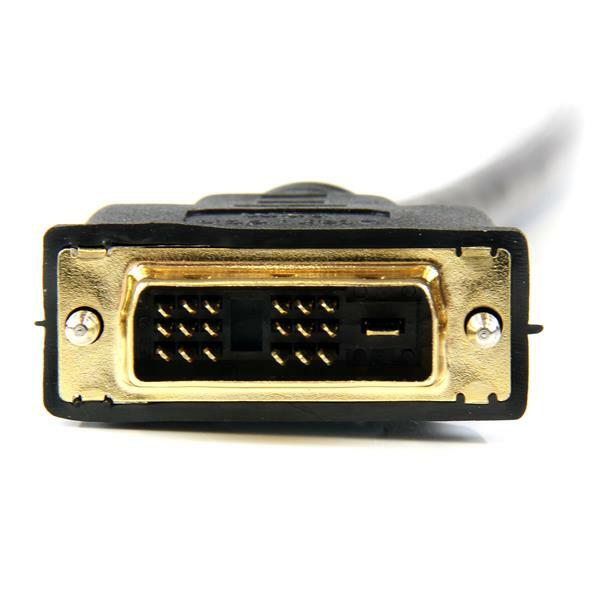 Note: HDMI to DVI cables, adapters and converters do not support audio unless otherwise noted in the Technical Specifications tab on the product page on the StarTech.com website.